The Errant set of armor and weapons, made by me. Uses vanilla textures. In an age long past, a righteous knight had a special set of armor and weapons made. The armor was the toughest in the land, and the weapons the strongest. Using ancient arcane secrets that have been lost to time, he had it all enchanted with the souls of powerful spirits. This allowed the weapons to be used without needing recharging at the cost of weaker enchantments, and allowed him to have more than one type of enchantment on his armor. It was unique, it was beautiful, and it was extremely expensive. This set includes a full set of armor and shield, a claymore, a sword, and a bow, all enchanted. It's all heavy armor, and all of the stats for it are based the best armor and weapons in the game, including weight and value. One piece is in (or very near) each city, with one more piece somewhere else. That's probably as specific as I can be without giving the locations all away, but if you just want the locations then look at the spoiler below. 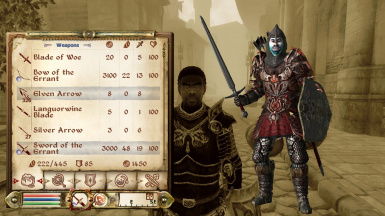 This isn't my first mod, but it's the first Oblivion mod I've released to the public. I know it would probably be a nicer mod if I made you work for the stuff by putting it all in dungeons or something, but that would have been a lot of screwing around, and I'm lazy. It also would have been better as a custom textured set, but I know literally nothing about that kind of stuff so it'll probably never happen. Also also, it might seem a little overpowered, especially as you can probably get all of it at about level 1, but it weighs a ton so it's not the greatest for a weak character and as I've said the weapon's enchantments are pretty weak, all things considered. If you do think it's too OP and have an idea on how to improve it or just have general comments, drop a post and I'll try to reply to all of them.